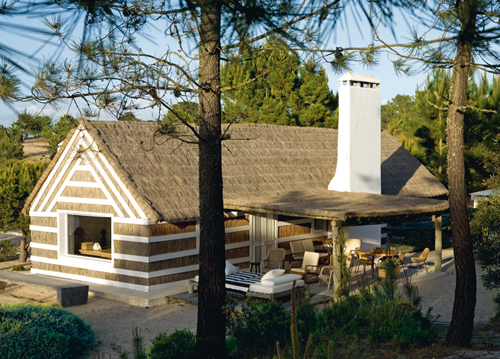 This is the retreat of French interior designer Jacques Grange. 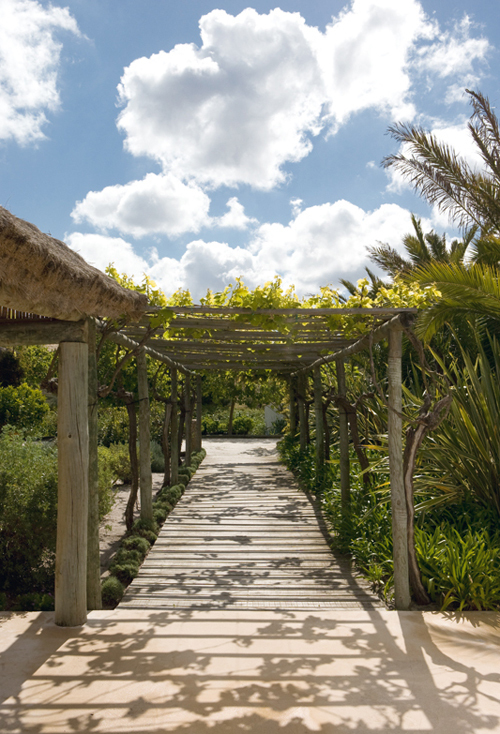 The house is located in the south of Portugal, not far from the Atlantic Ocean. The kitchen (above) is simple (nothing hi-tech) with cupboards and wall cabinets. 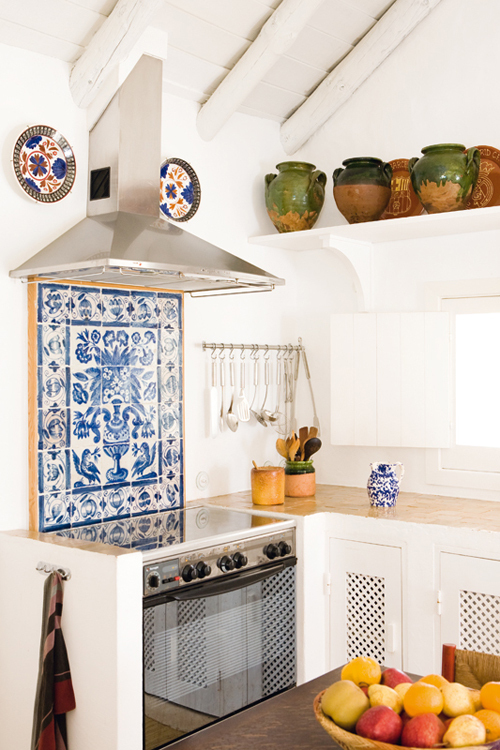 The blue and white tiles are typical Portuguese ceramic tiles. 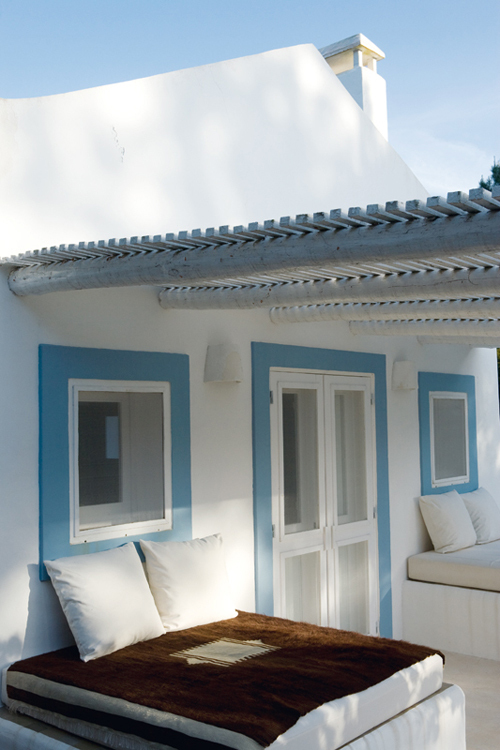 An outdoor corner protected by a wooden roof calls for long hours of doing nothing. Wood and straw are the main materials used for the house. Inside the atmosphere is simple, but sophisticated. Grange: “It was fun to decorate with things from nothing”. 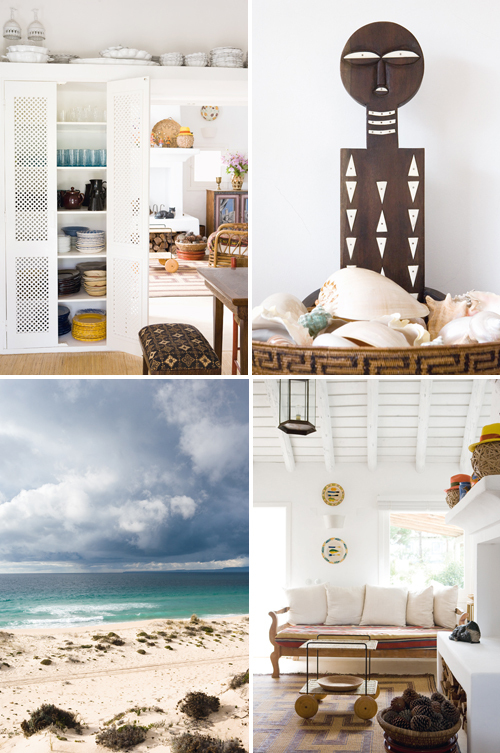 There are touches of Africa and on the floors you can find Moroccan rugs. Throughout the house there is also a large collection of pottery and porcelain. Beautiful home. I love its simplicity and am swooning over the blue and white tile backsplash. I love arbors. They’re so dreamy. Great! Can I move there now?! This is truly a beautiful house! It has a serene mood that I find lovely, thanks for sharing. Oh I love the ceramic tiles and especially the last picture! Would love to spend some time at a place like that! Me and my mother have a ceramic store in a village called Óbidos. We make tiles and love to see in houses like that!! Yes indeed it is an amazing house, in fact it is one of my favourite areas 2 go on Holiday and Louboutin also loves 2 go there on Holiday. You can find absolute gems in there and the best part is that it isn’t too” touristy”. Will be checking Raquel’s shop though next time I am nearby.